You want something easy and flavorful? This is it right here. I found this recipe from Food & Wine and knew it was what we were going to eat at some point over the Memorial Day weekend. Equipped with fresh Portobello mushrooms from the farmer’s market, I went to work slicing, dicing and prepping. The recipe is actually for a burger. I say don’t even bother with the burger part. These babies taste so good on their own, adding a hamburger bun seems like a sin. The filling is deceptively rich, and eating this as a burger would likely not leave much room for dessert, if there were any to be had. The filling has a versatile flavor that could be used on its own as a sauce (just add a little bit of heavy cream and perhaps some white wine and reduce it), serve it over vegetables or heck, even pasta. Oooo – or maybe even as a risotto! Now that would be good. Whichever way you choose to serve this, it will undoubtedly please the senses. The earthy flavor of the mushrooms, combined with the texture from the cashews and smoky flavor from the gouda are all big winners. Plus, what’s better than a mushroom stuffed with more mushrooms? That’s like, insane. And this is insanely good. Pre-cheese, ready to hit the grill. Brush the underside of 4 of the Portobello mushrooms with olive oil. Cut the stems and the remaining 2 mushroom caps into 1/2-inch dice. Transfer the diced mushrooms to a food processor and pulse just until finely chopped. In a large skillet, heat the 2 tablespoons of olive oil until shimmering. Add the bell pepper, shallots and the garlic and cook over moderate heat, stirring, until softened and beginning to brown, about 5 minutes. Add the chopped mushrooms and cook over high heat, stirring, until softened and all of the liquid has evaporated, about 5 minutes longer. Add the cashews and half of the basil and transfer to a bowl to cool. Stir in the shredded cheese and season with salt and cayenne. Light a grill. When the fire is medium hot, brush the grate with oil. Grill the mushrooms, stemmed side down, for 7 to 8 minutes, or until softened and browned. Brush the tops with olive oil and transfer them to a platter, stemmed side up. Pack the filling into the mushroom caps in a slightly flattened mound. Top with the cheese slices. Return the mushrooms to the grill, filling side up. 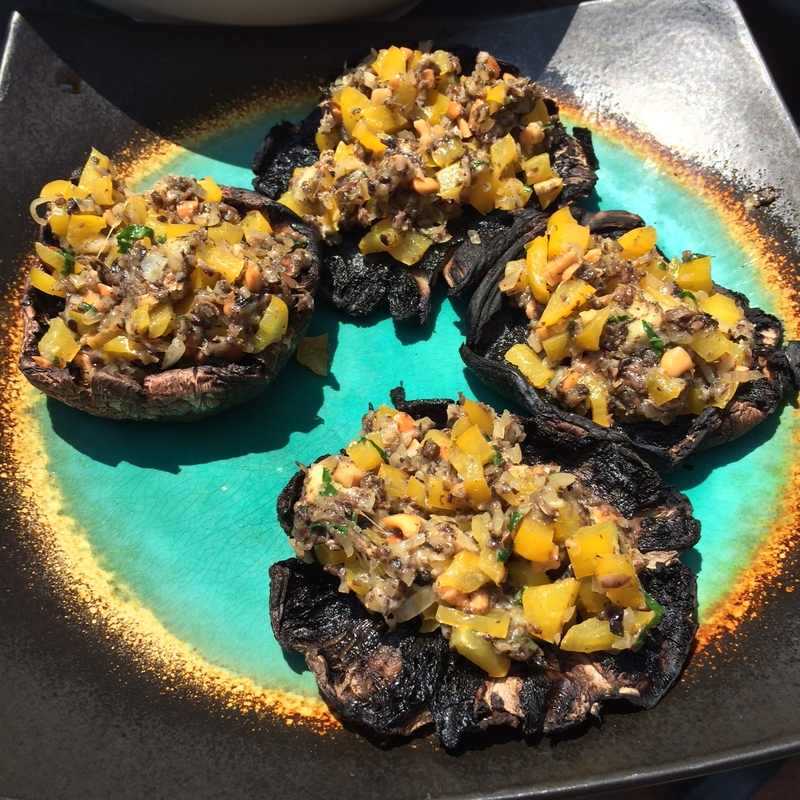 Cover and grill over a medium-hot fire until the cheese is melted and the Portobello bottoms are browned and cooked through, 5 minutes. Grill the cut sides of the rolls until toasted. Spread 2 tablespoons of the mayonnaise on the rolls’ cut sides. Set the mushrooms on the bottom halves, top with the arugula and tomatoes and serve, with the roll tops alongside.